Our object this week celebrates our “Founder’s Day,” observed on January 23rd every year, the day in 1858 that the President of the Kentucky Senate signed the bill that chartered our company and sent it to Governor Charles Morehead to be signed. You can read a copy here. Our first annual report was not published until November 1860, and much of it was written by our first “General Agent,” a colorful character named Dempsey B. Sherrod. This is a complicated story, so my blog this week will be a bit longer than usual. Sherrod was a graduate of the Mississippi School for the Blind. Like other blind men of his age, he had been taught to read using raised letters, but there were very few books available in that format. So he took it upon himself to change that. 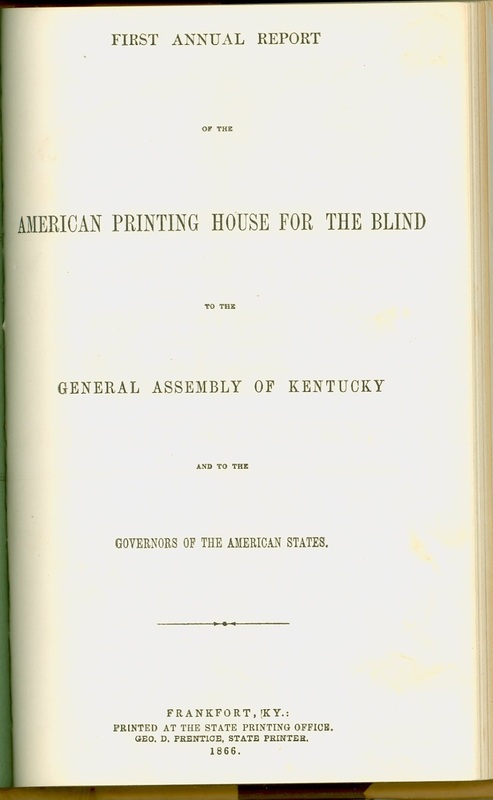 He began traveling around the South and Midwest, urging legislatures to support this thing he called The American Printing House for the Blind. His first success was in his home state but he eventually got support from several other states: Kentucky, Louisiana, Tennessee, Missouri, Ohio, and Indiana. We do not have any documentation about exactly why he—or his supporters--decided to place it in Louisville, but the Mississippi Charter, passed in November 1857, stated that it was to be located in Louisville. Remember that the Ohio and Mississippi Rivers were major routes of southern and western Commerce in the mid-19th century. The steamboat and the beginnings of the railroad had made Louisville a very important western city. So it was a logical move to put it in Louisville. Plus, the board at the Kentucky Institute for the Education of the Blind (KIEB) was very supportive. William Bullock, one of the major movers on that board, had authored both the state’s first public school law and the legislation creating the state school for the blind. But we don’t have documentation explaining any negotiations between the board at KIEB and Sherrod. Even the KIEB Annual Reports just announce the foundation of APH as a promising development for getting more textbooks, without explaining any role they might have had in bringing it to Louisville. Interestingly enough, although Sherrod was the company’s first “general agent,” after the Civil War he had a falling out with the APH Board and, soon enough, was in Washington lobbying Congress to create another body called the American Printing House for the Blind. Not very original, huh? This “double dipping” earned him heavy criticism from the leaders of the major schools of the day and by 1875 he was being described as a “bold, bad, blind man.” To this day, we are not entirely sure if Sherrod was an aggressive and confident blind visionary who was suppressed by the sighted leaders of the residential schools, or if he was a bit of a self-serving snake oil salesman. What is undisputed is that he lobbied several state legislatures to pass charters creating APH and is one of the key figures in our early development. Unfortunately, we don’t have a picture of Sherrod, and few of his papers. All we have of his writings are a few letters in the Archives at the Perkins School, and this report: “In 1857 I traveled through South-Western Mississippi, soliciting aid in our enterprise, and secured pledges to the amount of $12,035.25, to which, as you are aware, the Legislature added $2000, after our Board was incorporated. Previous to the incorporation of our Board, I had raised by collections, under an advisory committee, the sum of two thousand dollars for a specific purpose, viz: to publish an edition of Bullion's Analytical and Practical English Grammar, and Davie's Bourdon. On consultation, it was deemed advisable to reserve this fund, to be so used when the present contemplated Publishing House should be in practical operation, and this amount enters into the aggregate of total collections. 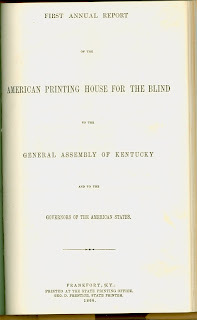 As we had selected Louisville, Ky., as the most eligible location for an Institution of this kind, and that point was designated in the Charter, I accordingly visited Kentucky in the winter of 1857-'58, and succeeded in procuring its incorporation, under the name of the "American Printing House for the Blind."